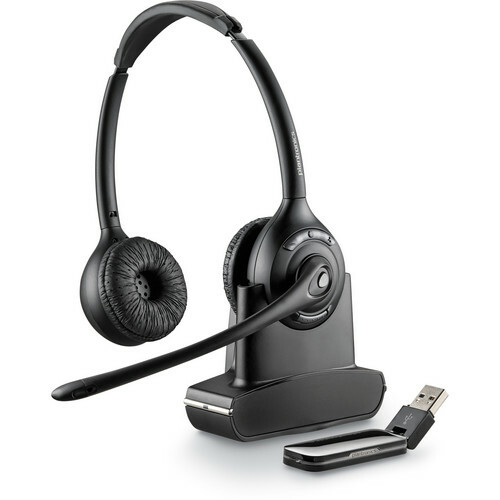 The Savi W420 from Plantronics is a rechargeable binaural USB wireless headset that can be used for making calls using your Mac or Windows computer running a supported softphone application. In addition to the headset the package includes a USB adapter, a charger base and a carrying case. The Savi W420 headset allows you to make wireless calls up to 300 feet away from the USB adapter. It features a rechargeable battery that can be charged by simply placing the headset on the charger base. It allows for up to 9 hours of talk time on a full charge. The Savi W420 is equipped with a noise-canceling microphone that is designed to cut down the transmission of background noise, improving audio quality and reducing ear fatigue. Additionally, the headset is equipped with remote control features which include one-touch call answer and end, volume, mute and flash. Plantronics Spokes software adds extra functionality to your headset. Box Dimensions (LxWxH) 7.4 x 7.0 x 2.1"
Savi W420 Binaural Over-the-Head USB Wireless Headset with Mic (Standard) is rated 2.7 out of 5 by 26. Rated 2 out of 5 by Dongle_broken from On my second dongle Like others here, the dongle broke after 11 months of use. There are no visible cracks or damage, but seems to be something internal (when the dongle is plugged in, Windows doesn't recognize it - tried all USB ports including ports on other laptops) because the dongle gets warm to the touch even when it's not recognized by Windows. While my employer purchased this headset for me, having it break while waiting for another one is extremely inconvenient. If I was buying this product, I would not recommend it. Other than the dongle, the headset is great (which is the only reason why I gave it a two star rating). If I buy one for personal use, it will not be Plantronics. Rated 4 out of 5 by gotto from Great quality and range, unfortunate mute. I bought this a month ago because I had previously had the over-the-head model and loved it. This in-ear model has the same high quality and range. However, having to hold down the volume down button to mute/unmute really bugs me. In the world of "sorry, I was on mute" during conference calls, even another second delay can be painful while trying to unmute. I would advise having a dedicated mute button like the over-the-head version has. That is more useful to me than the answer button this headset has. Rated 1 out of 5 by dfess from Not at ALL like my old CS50 I purchased this to replace my old reliable CS50-USB because the battery was going out. The sound on the W445 is tinny and breaks up, even on the setting that is supposed to be the best for sound and even when I am sitting right next to the transmitter. It's supposed to work within 300 feet but when I put it on the setting that is supposed to be for shorter distances with more power, I cannot reliably get 25 feet away. The ear rest is very flimsy and difficult to put on quickly. The earbuds don't work right either. The ONLY good selling point for this as compared to my old CS50 is the hot swappable additional battery. I am very disappointed in this product. I may still return it. Rated 5 out of 5 by Anonymous from Excellent Headset Excellent headset for the office. The two speakers are great in my noisy office. I can always clearly hear my customers and their needs. The w420 is very comfortable, especially when I am on the phone for long periods of tiem. I would reccomend this headset to everyone. Rated 5 out of 5 by KathyB from great quality I got the Savi 440-M headset and was pleasently surprised at the ease of use. The sound quality is super. Rated 1 out of 5 by BeepBeepBeep from Poor Battery Life This headset comes with lots of nice earpieces for a comfortable fit, but the battery life has been terrible. I'm lucky if I can make it through an hour call before it goes dead, even after charging it on the cradle all night. Very disappointed. Rated 1 out of 5 by JoseO from Very poor performance on Mac OS I have always had Plantronics product and they performed very well. This last headset (W420-M) is *really* bad. It does not work with Microsoft Lync on Mac OS but what's a lot worse is that it stops streaming audio without any indication. When not in a conference call, I usually hear music thru Google Music or Itunes. Suddenly the music streaming will stop but the applications will continue "playing" the music. You need to stop/pause and restart the music in order to listen again.